Dozens of students travelling aboard a Nova Scotia-based ship that sank off the coast of Brazil Thursday are safe and suffered no serious injuries in the capsizing, officials from the school that organized the trip said Friday. 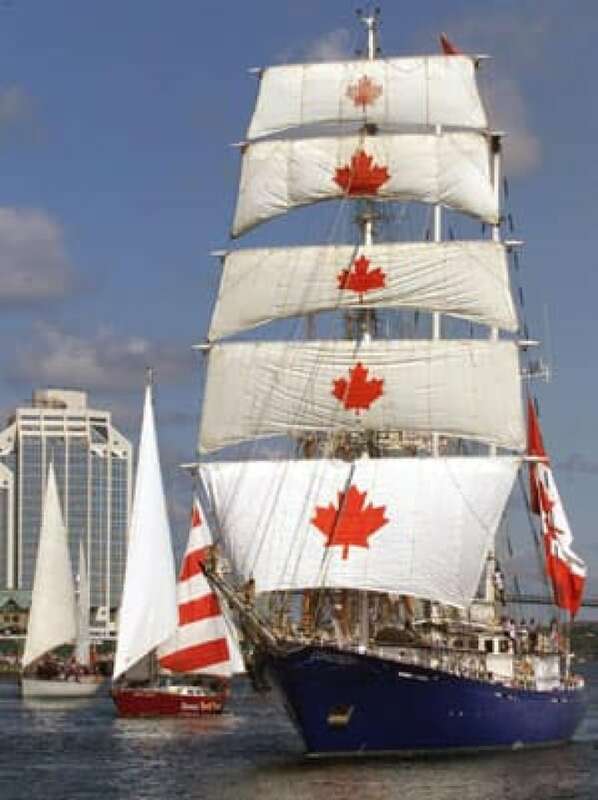 All 64 people aboard the tall ship SV Concordia, who were part of the West Island College Class Afloat program of Lunenburg, N.S., were rescued from four life-rafts by merchant vessels early Friday. The Brazilian navy said their ship went down in rough seas about 550 kilometres southeast of Rio de Janeiro. The 48 students, eight teachers and eight crew members had to abandon ship and spent the night in the life-rafts, which were equipped with blankets and some food. A Brazilian navy helicopter spotted the rafts and dropped medical supplies down to them. The students, teachers and crew will spend Friday night on two merchant vessels. It's expected they will be moved to a navy frigate and be taken to Rio de Janeiro Saturday morning. Drake Hicks, one of the students on board the Concordia, spoke to the CBC Friday evening from the merchant ship Crystal Pioneer. "We got on our emergency suits. There were a lot of people who were frantic and, you know, obviously very scared," she said. Hicks and the others spent 18 hours in the life-rafts before being pulled to safety. "Big waves in a small, tiny raft is not fun," Hicks said. "There were a lot of people who were throwing up a lot. It was definitely scary. We were all dehydrated, blurred vision, and then they harnessed us in and pulled us up." Kate Knight, head of the school, said school officials know everyone is all right, but have heard little else. "We just don't have any information about the state of the vessel or what caused the need to abandon ship," she told reporters in Lunenburg. "We're taking it hour by hour while we update families." The drama on the high seas began Thursday around 8 a.m. AT, when Brazilian search authorities received a distress signal from the 57-metre ship. They contacted the rescue co-ordination centre in Halifax, which alerted the school. Terry Davies, spokesman for Class Afloat, a program that allows high school students to study while at sea, said his group tried in vain to contact the ship by email and satellite phone. "We were finally able to confirm last night [Thursday] at 8 o'clock that the Brazilian authorities were sending their folks to the last reported co-ordinates," he told CBC News. Davies said the fact that everyone managed to get off the ship safely is testament to the crew's expertise. "Well, it does speak to the quality of the training," he said. "A superb execution of an evacuation that probably was very difficult. To come out of something that involves potentially the loss of a vessel and come away with all of its crew is probably nothing short of remarkable." Brazil's navy said it picked up the distress signal from Concordia and alerted merchant vessels. Three hours later, a military plane spotted a life-raft in the area from which the signal came. Rear Admiral Leonardo Puntel of the Brazilian navy told CBC News that the plane was able to tell the merchant ships where to look for survivors. By the time a navy rescue ship arrived, all Concordia passengers and crew had been plucked to safety by the Hokuetsu Delight and the Crystal Pioneer. "There were two injuries, but they were minor," said Puntel. The navy said it was told by the Concordia crew that their ship capsized in high seas. It has been a terrifying time for parents of the students. Shelley Piller, whose daughter Alicia was aboard the Concordia, said she heard from school officials late Thursday night that the ship had sunk and everyone spent 18 hours in life-rafts. "We were just absolutely horrified, and we've been up all night," Piller told CBC News from her home in the community of Kenilworth, about 50 kilometres northwest of Guelph, in southwestern Ontario. Brad Unsworth’s 16-year-old daughter, Lauren, was on the Concordia. Unsworth, of Amsterdam but originally from Halifax, said that he couldn't eat or do much of anything when he heard the ship was in trouble. "It was really up in the air what the status was on the children — whether there were any survivors; if so, how many," Unsworth said. "When they came back and confirmed the students and crew were OK, of course, that was a huge relief." Five of the students are from a Calgary-based private school, which is also called West Island College. "It is a great relief to know our students are safe and will soon be reunited with their families," CEO Carol Grant-Watt said in a statement. "I want to thank parents and students for their understanding and support. This morning, we held a student assembly and are continuing to help our students and faculty deal with this news." Knight said school officials were on their way to Rio to meet with the students and crew. The tall ship left Lunenburg last September carrying students in Grades 11 and 12 and first-year university. Most are Canadian, with others coming from the U.S., Mexico, Japan and other countries. The floating school had been expected in Montevideo, Uruguay, on Thursday. The Concordia was built in 1992 in Poland. It meets "all of the international requirements for safety" and passed inspections by the U.S. and Canadian coast guards, the school's website states. "We have a very good safety record, and, certainly, we have never had an incident or anything remotely related to this," said Knight. Knight said the life-rafts are all equipped with blankets, medical supplies, food and water. Students are required to take part in abandon-ship drills regularly, Davies added. People who know the Concordia said it's difficult to imagine what could have caused it to sink. Kevin Feindel, business manager at Lunenburg Industrial Foundry & Engineering Ltd., said the Concordia is a large, well-built ship with a very experienced crew. "It's hard to imagine a set of circumstances that would make her capsize or take on enough water to make her founder," he said. Michele Stevens, who makes sails at her shop just outside Lunenburg, outfitted the Concordia and has also sailed on the vessel. She said the Concordia was a good ship. "I felt that the boat was very stable, and I felt the sides seemed quite high enough," she said. "I felt very secure on the ship at all times. They didn't take any risks at all, I felt." The Transportation Safety Board of Canada will assist its counterparts in Barbados, where the Concordia is registered, in investigating the cause of the sinking. Prime Minister Stephen Harper thanked the Brazilian navy and the merchant ships for their "swift and heroic response." "The skill and compassion demonstrated by Brazilian rescuers is a tribute to their training, spirit and seamanship," Harper said in a statement. "Their efforts are deeply appreciated by Canada and will undoubtedly serve as an inspiration to the young Canadians who were aboard the SV Concordia." Canadian Foreign Minister Lawrence Cannon also issued a thank you to Brazilian authorities.